Simple Hands: Holly and Jolly. I hope that your holidays were happy and healthy. We managed to pull off a really fun couple of days with family and friends and ended feeling grateful and loved. This year in the new house felt flush with so many great things. We hosted most of the family for Christmas day and had a great brunch of oysters Rockefeller, homemade pecan rolls, and mimosas with fresh juice. It was amazing! Then we saw more friends and met the newest member of our clan that was born on the 23rd! Here are some photos I wanted to share. Dancing lights set to music. This place had their own radio station set up! Waiting for Santa and his reindeer. O was contemplating just how he'd get in the house and avoid the fire in the fireplace. 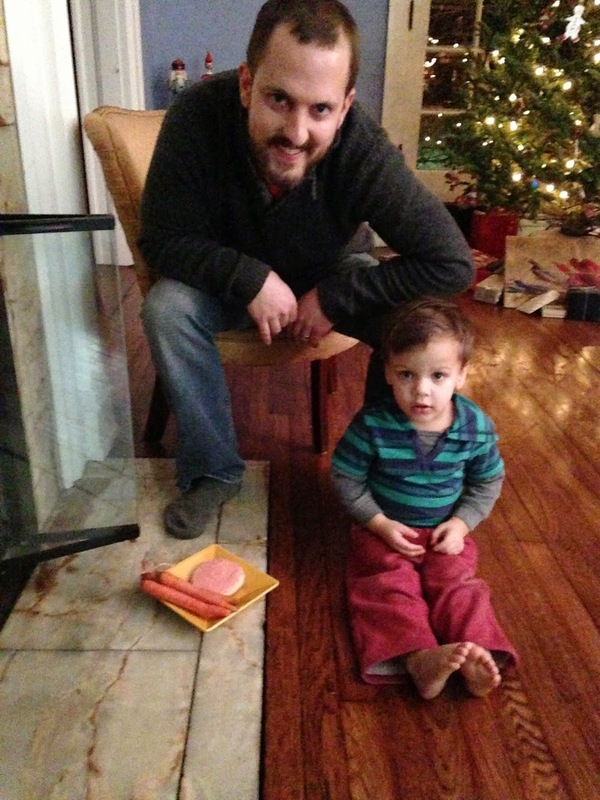 Once he was in bed JJ assembled this awesome train table that he scored on Craigslist. 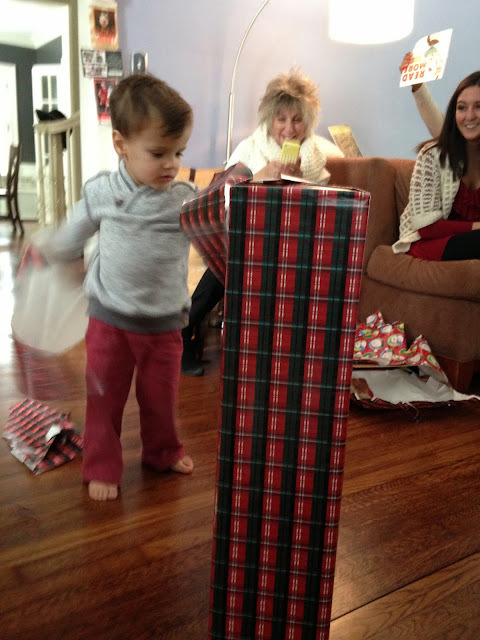 He had it in the house for over a month and could hardly wait to give it to O! The morning was filled with surprises including my new yellow bike! Which was a complete surprise and about four years in the making! And now O can officially join the families since he has his own work bench and tools. His Papa and uncle know him well. I just had to include this one. 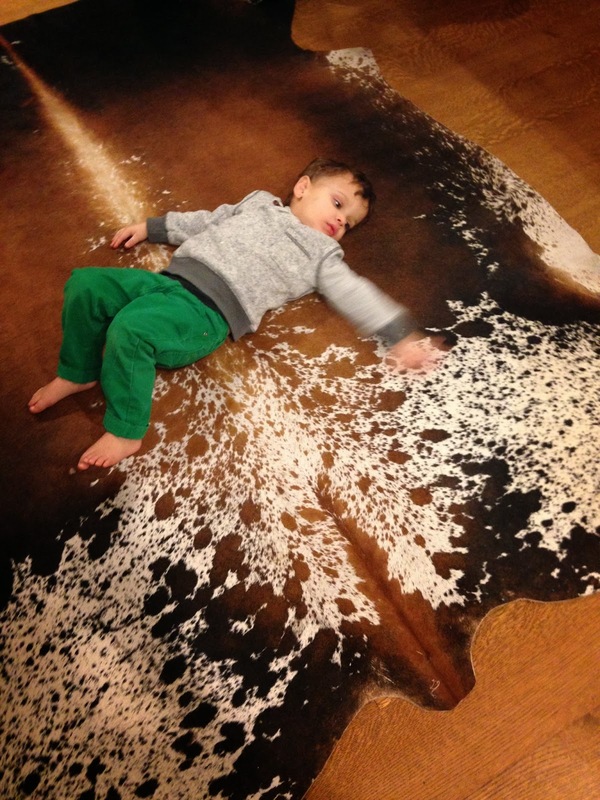 Every time we are inside our friend's home O finds a way to lay on this cowhide. He loves it. It's such a strange thing to me since it's not exactly snuggly, but he thinks it is great. Not to mention that tired out look on his face, Christmas was good to him. I hope that all of you had a wonderful day with your families. As you can see, we missed out on a full family photo once again so you'll just have to believe that we looked lovely in our matching green accents. Have a happy weekend! Looks like you had a wonderful holiday! Happy New Year!